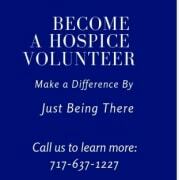 Hospice Patient Care Volunteers spend their time with patients. Volunteers travel to the place where the patient resides. This could be the patient's home, family members' home, or a long-term care facility. While volunteers do not provide any medical or hands-on care, their visits allow caregivers the opportunity to run errands, attend appointments, catch up on household duties, or to simply rest. During visits, you could be reading, providing a companionship, or being a calm presence. 1 hour per week, varies.